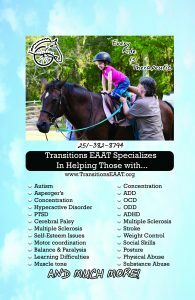 Transitions EAAT is a private, NON-PROFIT Ministry (a federally registered 501 (c) 3) that does NOT receive ANY money from any branch of government (local, state or federal). Our ministry efforts are supported and sustained ONLY through donations of private individuals and corporate partnerships. Our founder and president, Dawn Honeycutt, has worked with horses and riders for 40+ years and has competed at the Prix St. George Level in dressage. She has Graduate level work as a substance abuse counselor and is the loving mother of two special needs children and the caring wife of a husband who is disabled due to brain damage. If you’d like to support us but can’t seem to find a stamp, you can now donate to us online. Pastor Lonnie and he’ll arrange to have your donations picked-up. If there’s a special project you’d like to contribute to simply place the general description in the Memo Field and, if we have any trouble figuring it out, we’ll call you. Otherwise, you can simply leave the Memo Field Empty or list ‘General Fund‘ and we’ll use your donations wherever we think they’ll benefit the most.